PT Garansindo Inter Global as the Authorized General Distributor (APM) Jeep brand in Indonesia, officially launched the Jeep Wrangler Trailstorm - special edition, in Indonesia International Motor Show (IIMS) 2016. "Manufacturers spend a lot of Jeep Wrangler Jeep Special Edition, where formerly Garansindo present Jeep Wrangler Call of Duty, Willys Edition, Arctic Sahara, and the 70th Anniversary. Line up is always getting very positive feedback from the market, "said Chief Sales Officer PT Garansindo Inter Global, Aaron Sjech. Using the base Jeep Wrangler, special edition cars are getting some modifications by MOPAR, sepert door half-door, tires, wheels, bumper 10 th anniversary, tail lamp guard, high-top fender and engine hood dome. To spur the kitchen, holding a Special Edition Jeep Wrangler 3.0L V6 Pentastar engine, which is capable of producing up to 230 horsepower with a torque of 285Nm. Together with other variants of the Jeep, Jeep Wrangler comes in special edition Garansindo World booth in Hall B, JIExpo Kemayoran place at IIMS 2016 titles ranging from 7 to 17 April 2016. 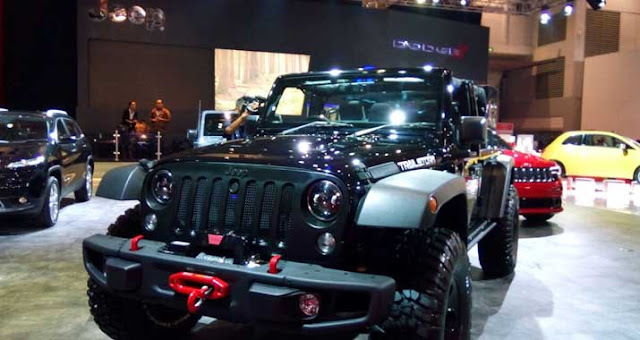 Has the status off the road, the price offered for the special edition Jeep Wrangler around Rp1.5 billion.